South Korea has launched its biggest-ever anti-submarine exercises, the military says, despite warnings of retaliation from the North. Some 4,500 personnel are taking part in five days of drills in the Yellow Sea, near the disputed maritime border. The South is making a show of strength amid continuing anger over the sinking of one of its warships in March. Seoul says a North Korean torpedo sank the Cheonan, but Pyongyang denies this and says the drills are a provocation. Forty-six South Korean sailors were killed when the Cheonan went down in the Yellow Sea on 26 March. 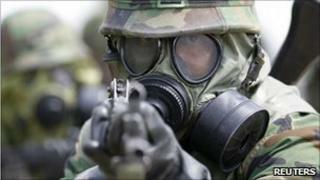 The latest drills, which follow a joint US-South Korean military exercise, will involve 29 ships and 50 planes. Although the Ministry of Defence says the ships will stay clear of the disputed west coast sea boundary, marines stationed on islands close to the border will conduct live-fire exercises. But military officials said that the guns would face south and described the exercises as "defensive" in nature. The fall-out from the Cheonan sinking, the location of the latest exercises near the disputed maritime frontier, and Pyongyang's rhetorical response to the manoeuvres all add to the sense of increased volatility on the peninsula right now. But there are also longer-term trends on display here that could exacerbate the tensions in the future. One is the continuing development of the South Korean navy into a major, modern regional force, with some of the most advanced warships in the world. The North Korean navy, in contrast, continues to rely on an ageing assortment of submarines, midget subs and patrol craft. The expansion of the South Korean navy, and the possibility of increased resentment on the part of its northern counterpart, only increases the chances of future flash-points. "The focus of the exercises is to strengthen our response to the enemy's asymmetric provocations and also our joint operations capabilities," an official at the Joint Chiefs of Staff told Yonhap news agency. "We will not tolerate any kind of provocations by the enemy, and the drills will allow us to be fully prepared for combat." In North Korea's official media, a statement attributed to military leaders called the exercises a "direct military invasion aimed at infringing upon the DPRK's [North Korea's] right to self-defence". Military leaders "made a decisive resolution to counter the reckless naval firing projected by the group of traitors with strong physical retaliation", the statement said. Last month, the North threatened nuclear retaliation over joint US-South Korea naval exercises, but these passed without incident. The disputed Yellow Sea border has long been seen as a flashpoint and there have been a number of clashes there in the past. The boundary was drawn by the UN at the end of the Korean War in the 1950s - and North Korea does not recognise it. The US and South Korea plan to hold more military drills in the coming months - a move that could raise tensions with China. Beijing has refused to blame Pyongyang for the sinking of the Cheonan. It opposed the decision to hold exercises in the Yellow Sea, urging against any action that could exacerbate regional tensions, and has also held its own military exercises in recent days.